If you are looking for a fine read about nature, this is it! For over 16 years I have been writing a weekly nature column for the Idaho Falls Post Register. 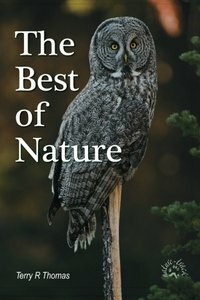 The Best of Nature, Volume 1 is a compilation of some of the best essays. This is nature writing that will entertain and inform at the same time! You may find it hard to put this book down. The Best of Nature covers a wide variety of topics including humorous glimpses of nature, philosophy, natural history, and conservation. Readers praise the style, breadth of subject matter and my ability to communicate complex and emotional topics in a relaxed and understandable manner. From teenagers to octogenarians, from the coffee shop to the school room, these columns are widely read and enjoyed. Many readers send them on to friends and family across the nation. Some of the columns here are my personal favorites, others seemed to strike a chord with readers. Most have an important message or lesson that will resonate with readers. They are written with a goal to simultaneously entertain and educate about the wonderful workings of nature. Hopefully, at least one story makes you laugh out loud and another one brings a tear to the eye and warms your heart. Your recent article, The Eyes Have It, was really wonderful. I frequently send your articles off to friends around the West and it is always well received. This article, in particular, was very popular. Friends, and friends of friends (your articles get passed on and on down the internet line), are asking where to read your column. WOW. What a phenomenal piece you wrote. You are amazing. I love reading articles that you have written. They are so down to earth, easy to understand, and keep your attention. It makes a person want to know what you are going to write about next, or when you will have an update article. Keep up the good work! LOVED your “Lessons of birds on getting along” – have enjoyed your other articles too, just haven’t sent a note. Just wanted to tell you I appreciate the articles you have been writing. This one, Habitat Piranhas, particularly made me smile. Thanks - and keep 'em coming! Editor: I also wanted to tell you how much I value Terry Thomas and his columns. They are wonderful!! They are well written and well reflect the wonder of Idaho's wildlife and nature. My thanks to him. I take great pleasure in reading them each week. I just read your latest nature column on the Power of One. Excellent! I always find your columns thought-provoking. Keep it up. Your article today was excellent as was the one a few weeks ago about your children becoming independent and moving out on their own. Excellent writing! You hit a home run with your article on "Big Questions in Nature". It should be required reading for all of our adults in this state who have lost touch with Nature......great job! I just wanted to let you know that I really enjoy reading your articles in the Post. Thanks! I quite enjoyed your article (on bird houses) in the paper yesterday......so did my parents and kids. We visited the websites and spent a couple of hours reading and learning! Thanks! Forgot to mention how much we enjoyed your column last week, Bloom Where Planted. Some of the best writing yet. The Post Register is fortunate to have your weekly columns. This time I cut it out ---- often times my wife does it. Great article in the paper. It’s those special personal encounters with wild creatures that mean so much to us over the long term and they enrich our lives. Memories of those feelings---I remember the incredibly delightful feeling of a chickadee landing on the brim of my hat one frigid day in Antelope Creek, twenty-five years ago. Thanks for your story. Just a note to thank you for your series on Nature. It's one of my favorite sections of the Post Register. I am the jazz music director at BYU-Idaho but am a frustrated naturalist. In school I was torn between specializing in music or natural history… I too have stalked the great blue herons - they are very tricky and hard to approach, as you say. Also enjoy seeing swans overhead flying north - there's no sight like that! Please keep up your good articles. They're great.